Singles with disabilities face a lot of challenges in life and dating is another aspect where they are bound to encounter certain difficulties. Because of this, online dating can be of great help. Thanks to websites like Disabled Singles Dating, disabled dating no longer has to represent a difficulty but rather a beautiful, fun, and hopefully successful experience. Check out our Disabled Singles Dating review and get ready to turn over a new leaf in your love life. Disabled Singles Dating leaves a pretty positive first impression. It’s not a big fancy dating website and obviously, it’s still in the early phases, so there are certain things that can still be improved, such as design. But it’s also pretty clear that it’s a website that works and that already has a solid membership base, which is the only thing that matters when it comes to matchmaking sites and services. As we mentioned earlier in our Disabled Singles Dating review, the design of this website is one of the things that could use some improvement. We’re not saying it’s ugly, but we’re definitely not saying it’s pretty either. It looks pretty cheap and outdated and a bit messy too. However, if you don’t care about this sort of thing, you’ll be more than happy with this website since everything else has been done very well. The interface, however unappealing to the eye, is actually quite efficient. Disabled Singles Dating is a very intuitive website, meaning that everything you are looking for is located right where you expect it to be. The front page is the only page that seems a bit cluttered, but once you log in or sign up, you will be able to navigate the website much faster and more freely. Disabled Singles Dating has great functionality and all of the features work just fine. 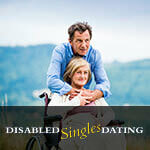 Disabled Singles Dating has everything you need in terms of features, nothing more, nothing less. The main purpose of a dating website is to look at other people’s profiles and talk to the people you like so that you can find someone who shares your interests, hopes, and dreams and who might become your friend, companion or lover. Well, Disabled Singles Dating offers all the features you need to accomplish that. Users can choose their preferred mode of communication – there is e-mail, there is chat, and there are instant messages. There is also a fun little non-verbal form of communication called “flirts,” which you can send to the users you find interesting and would like to get to know better. Some people are too shy to start a conversation out of the blue, so these flirts make a great icebreaker. You can also use the Little Black Book, where you can add people you are particularly interested in. However, you will need to have their permission before you can add them to your Book. Users can also compile lists of favorites and they can block members they don’t like by checking the “not interested” box. Disabled Singles Dating has chat rooms as well, and they are usually quite active and full of people eager to chat. New or prospective users should know that not all of the features are available to everyone. Free users can only create a profile and upload a photo, send and receive flirts, and receive IMs. The rest of the features (e-mail, chat, sending IMs, adding favorites, blocking, Little Black Book) are available only to those who subscribe to a premium account. The one thing that everyone reading our Disabled Singles Dating review wants to know is how big the membership base is and what’s the crowd like on this website. We are happy to report that while Disabled Singles Dating does not have the largest membership out there, it’s a growing community of singles with disabilities who simply can’t wait to meet new, exciting people. Most members are from the United States. There are people from all over the country so regardless of your location, we are sure you’ll be able to find great, fun, exciting singles right in your area. From what we can tell, the great majority of profiles are real, legitimate profiles of real people. Some websites are literally riddled with fake accounts but fortunately that’s not the case here. Disabled Singles Dating deserves to be right up there with the best disabled dating websites not only because it’s a great, quick and easy way to meet singles with disabilities, but also because it’s a very good, reliable and functional website that is only going to get bigger and better. What bothers me about this the most, is they took my money one day, then the following day they close my account with absolutely no warning, no courtesy email, nothing. This is a really poor way to do business. 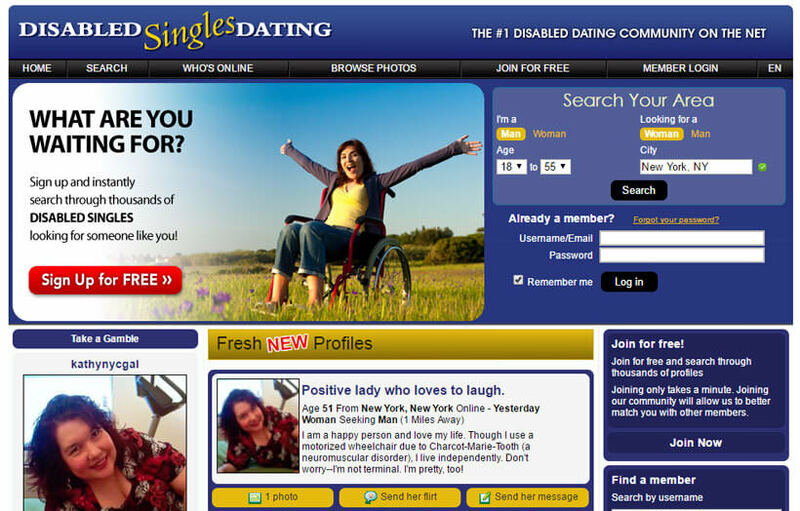 Finally disabled people get a dating website they deserve!! Us folks with some form of disability can’t really go out and do the whole dating game the same way as the others, I mean, a person in a wheelchair can’t really meet the breaking dawn on the dancefloor, and so on. Which is why I applaude whoever came to the idea of starting disabledsinglesdating.com. God bless you sir or madam, we are forever indebted to you! After my latest spine surgery, my “roommate” from my hospital room told me about disabledsinglesdating.com and told me I should join. At first I was reluctant and suspicious, but then I realized it was a legit site and now I’m a proud member!